As the mountains and forest come alive in the spring, the solitude of the hiking trails have an abundance of wildflowers tucked within the virgin forest. This is a great chance to see the forest awaken. For the more urbane, get an early start to your wardrobe plan with the many great buys in the shopping outlets of North Conway. The bargains seem even better when you don’t pay any sales tax. The lakes are warm enough to swim everyday now. The spring rains have turned gardens into colorful displays all over town. Hiking trails have been cleared, boats are in the water and the golf courses are in full swing. Summer at Evergreen Valley is the way vacations should be. Located in the White Mountain National Forest, Evergreen Valley is a winter wonderland. With access to major ITS Trails in Maine and New Hampshire this is an ideal base for snowmobilers. Check it out, we are now listed as one of the top 10 places to go snowmobiling in the country America’s Best and Top Ten X-country and snow shoeing is at your doorstep. You are an easy drive to some of the best ski areas in the east. We offer discount tickets for Shawnee Peak (20 miles) and free night skiing the day of check-in. Other ski resorts close by include Attitash, Bretton Woods, Cannon, Wildcat, Cranmore, Loon Mountain, Sunday River. Snowmobile rentals are available at Northeast Snowmobile Rentals. 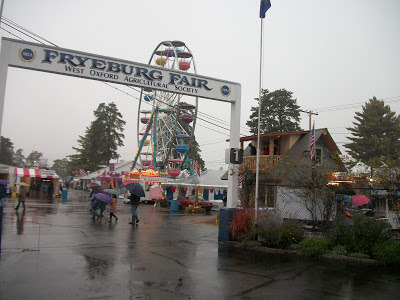 New England’s largest and longest running fair, the Fryeburg Fair, awakens this quiet rural community during the last week of September. This is the original country fair which hosts crafts, horse racing, oxen pulls, plowing matches and all kind of local foods. A must see event. The apple crisp booth is the stuff of local legend. The Pie Tree Orchard is the local favorite for picking your own apples. They also have activities for children such as wagon rides and build a scarecrow.